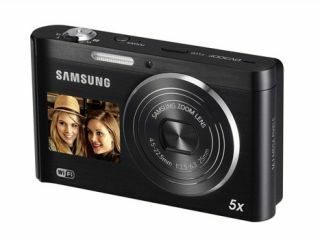 Samsung has introduced a new compact camera to sit in its "2 View" range of dual screen models. The DV300F features both a rear screen and a front 1.5 inch LCD display. It is also the first model to feature Wi-Fi technology, allowing photographers to email images or upload them to social media sites. Another benefit of wi-fi connectivity is the ability to wireless connect to a home computer for instant transfer of images. Other specs on board the DV300F include a 16 million pixel sensor, 5x optical zoom and 25mm wide-angle lens. Several colour ways are available, including black, silver, navy and red. Fun features which are a common element of Samsung compacts include Magic Frame, Picture in Picture, Funny Face, Split Shot, Artistic Brush and Motion Photo. Magic Frame gives the ability to include 12 fun background templates or create poster-art. Picture in Picture allows one image to be inserted within another, while stills can be combined with videos to be uploaded to YouTube and other social networking sites. Funny Face allows goofy grins, comical noses and crazy eyes to be added to portrait shots and has 8 different modes. Split Shot allows up to three different images to be merged to create a masterpiece, while the new Artistic Brush feature can transform photographs into black and white, sketch and other artistic attributes. Motion Photo allows for videos to be captured with a subject moving, while everything else around it is still. The Samsung DV300F UK price is yet to be announced, while the camera will be officially unveiled at CES 2012, taking place in Las Vegas from January 10th.